CHILDCARE centres don’t normally take children over six years of age so it was a surprise for some youngsters to find senior citizens roaming their halls last week. 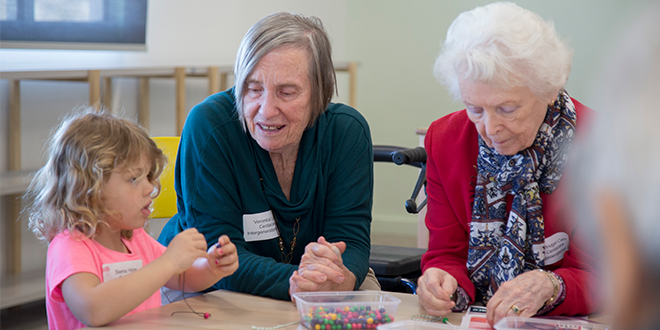 Residents living in Brisbane’s south-west and receiving support from Centacare’s aged-care services spent half a day at Good Shepherd childcare centre, Springfield Lakes, to trial a targeted intergenerational program. The senior citizens spent nearly two hours with children from the childcare centre creating beads, painting masterpieces, rattling shakers in the music room, and making relaxing bath salts. Among the oldest people in the centre was 94-year-old Centacare client Bob Bean, who doesn’t get many chances to see children under five anymore. “It feels as though my life is finished, and I see these kids coming up and it’s good,” Mr Bean said. While he couldn’t keep a smile off his face during his interaction with the children, he also worried for their future. “I worry for them because I think life is going to be harder and harder for them,” Mr Bean said. 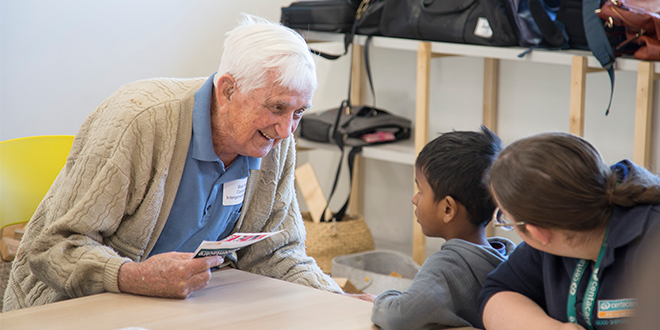 Youthful conversation: Bob Bean spills his age to a young boy at Centacare’s Intergenerational Day event at Springfield. Photo: Emilie Ng. The intergenerational day was funded by the State Government to mark National Seniors Week. Centacare South West community services operations manager Rosemary Poulgrain said the day was inspired by the Mount St Vincent Intergenerational Learning Centre, a Seattle-based hub that operates a nursing home and child-care centre on the same premise. The centre has seen social isolation levels decrease for the residents, while the children learnt to respect older people faster than peers who had no interaction with the elderly. Mrs Poulgrain said numerous studies on intergenerational programs showed positive benefits for both seniors and children. “So the benefits for them are a greater sense of wellbeing, heightened mood, a greater sense of happiness,” she said. She also cited a study in Japan that found senior citizens who interacted regularly with young children smiled more. “They did a weighted smile index and found that when older people were interacting with younger people, the number of smiles increased a lot,” Mrs Poulgrain said. Elspeth Davis, a regular client at Centacare’s Activity Centre in Jamboree Heights, can back up the Japanese study after her playtime with young Titus Joseph. “I started with a little smile and it’s gotten bigger all day,” Mrs Davis said. She said being around young children could help people on the other end of the life spectrum “to see things new”. “Things seem to get a little bit jaded as you get older, and it’s looking at the world through young eyes and you see a youthful beauty,” Mrs Davis said. Young and old: Veronica Lynch and Bridie Carr creating beads with Sienna Hilder. Photo: Emilie Ng. Canossa Village resident Bridie Carr said she loved being around “little people” and would be open to spending time at a childcare centre once a year. She said the half-day program motivated her to “leave the world a better place” for the next generation. “You’re so conscious that we’re only holding it temporarily for them, for when they grow up,” Mrs Carr said. 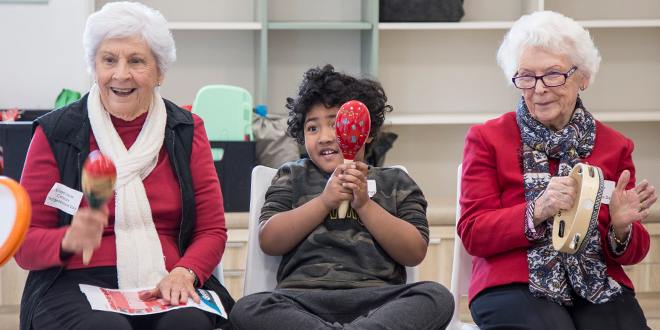 Centacare’s Springfield Lakes childcare centre manager Janelle Moro said many children under their care had little contact with their grandparents so regular interaction with seniors was beneficial for them. “As an educator I think it’s valuable for the community and for childcare to interact so that each party knows the valuable benefits for the integration of seniors with children, and children with seniors,” Mrs Moro said. “I think for me, it’s to understand and have some respect for the elders as well. I know my son asks a lot of questions about why they look different, why they walk slower. Mrs Poulgrain said Centacare was planning to develop a targeted program to bring seniors and young children together for two hours over six to eight weeks. Centacare is also working on a program for Dementia Awareness Month, held throughout September, focusing on technology for people with dementia. “In the program I want the young kids to show how the young people interact with technology,” Mrs Poulgrain said. 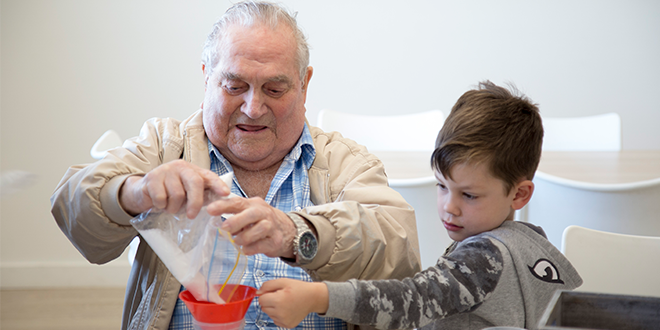 Fun activity: Albert Russell makes bath salts with a young child from Good Shepherd childcare centre, Springfield Lakes. Photo: Emilie Ng.